Just the right balance of performance and durability. It takes just the right balance of materials to make a great tire. 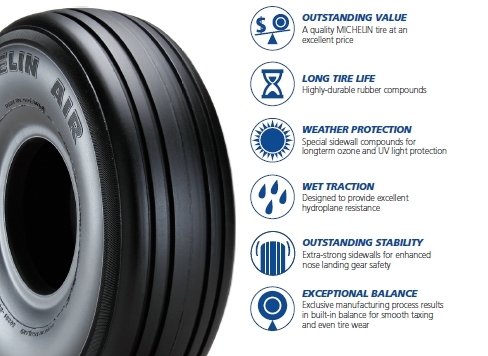 And in the Michelin ® AIR TM tire those materials work together very effectively to help provide you with dependable performance throughout a long tire life. Thick rubber in the tread area helps provide for a long tire life. Contributes to lower maintenance costs due to fewer tire changes. Provides a firm (tight) fit to help reduce movement between the tire and wheel. Helps improve lateral stability for a long tire life, even under rough landing conditions. Helps absorb lateral impacts associated with landing. Designed to help the tire achieve a full life, even under adverse conditions. 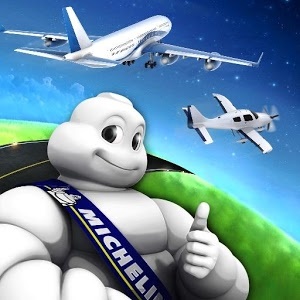 Proprietary Michelin production processes help balance stresses within the tire structure. Strong, yet lightweight nylon cords are designed to exceed strict industry standards for overpressure strength. Results in an effi cient, lightweight product with excellent balance properties for smooth taxiing, even wear, and resistance to heat buildup for a long tire life.